1. Cut steak into strips lengthwise, then cut across the grain into 1/8-inch slices. Combine beef with soy sauce, garlic and black pepper. Toss well, cover and refrigerate for 30 minutes. 2. Combine 1 1/2 tablespoons water, oyster sauce and crushed red pepper in a small bowl. Set aside. 3. Cut broccoli into florets. Peel stems and cut diagonally into 1/4 inch slices. 4. Heat one tablespoon canola oil in a large skillet over medium heat. Add beef mixture and cook 3 minutes or until beef is browned, stirring constantly. Transfer beef to a bowl. 5. Heat the remaining 1 tablespoon canola oil the pan over medium high heat. Add broccoli and cook for 3 minutes. Add 2 tablespoons water and cook another minute. Add the bell pepper and cook for 30 seconds, stirring constantly. 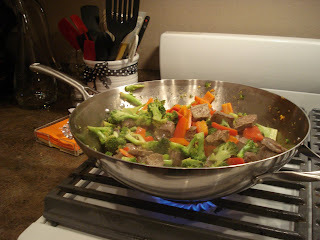 Return the beef mixture to the pan. Stir in the oyster sauce mixture, cook until heated. Serve over rice. *Max and I now double the recipe since we like leftovers of this simple, yummy meal, and can easily polish off the "6 servings" between the two of us!